Our team has extensive experience in caring for children. We are a culturally diverse centre. Our team works collaboratively with our parents to meet their needs and expectations and to provide quality outcomes for all children. Our Service partners with local schools and external community agencies to keep families informed and assisted wherever possible. We are committed to best practice and hold membership and links with a number of professional organisations including, but not limited to, Early Childhood Australia, the Australian Childcare Alliance and Nutrition Australia. 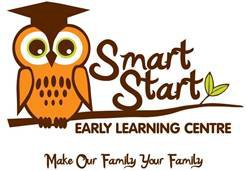 To ensure that every child who is a part of the Smart Start family gains foundation skills and knowledge from within our service to foster and develop their social, intellectual and emotional growth. This is achieved by providing high quality education and care programmes across the service which meet or exceed the needs of all children in our care. As a service, we are always examining and reflecting upon our processes to ensure best practice via hands-on experience, current research, good management and professional development. Our team at Smart Start is committed to protecting, nurturing and educating the children in our care. We understand that each child’s personality is individual and precious. We honour each child’s family background and culture and endeavour to develop and maintain positive and supportive relationships with families within our centre. We strive at all times to maintain an environment that encourages children and families to feel that they belong, and promotes play-based learning which is emergent and contextual. We believe it is every child’s right to receive quality care and education in a safe environment free from bias. We aim to create an atmosphere of belonging where our children are excited at the thought of spending their day with us, and our families have peace of mind, knowing that their children are safe and developing to their full potential. We work together to develop practices and life skills to create an awareness of what it means to live sustainably. We believe in the importance of building relationships that are warm, nurturing, inclusive and respectful to create a sense of belonging. The children are viewed as competent and capable learners. We encourage children to actively contribute to their learning and a sense of agency within their environment. We believe that families are the first teachers and our role is to work in partnership with families to provide an extension from home. We believe strong partnerships are the key to providing positive outcomes for children. We have an open door policy and welcome families to become a part of our family. We believe in the importance of play and recognise learning occurs everywhere and at all times of the day. We promote a play based program that encourages children learn to discover, imagine, create problem solve, take risks and socialise. Learning spaces are inviting and cater to different learning styles. Children’s ideas are the “voice” of our program and through intentional teaching we seek to implement an enriching, meaningful and engaging program. We believe children are individual and come with a range of interests, experience and knowledge. We recognise family input is an integral part of the curriculum. We strive to implement a program using children and families’ input as the foundation and reflective practice for improvement. We incorporate the Virtues program which aims to empower children to develop empathy, tolerance, respect, emotional regulation and to live by their highest values. We believe in mutual respect for one another and working in an environment of professionalism, caring and listening. As a teaching team we are committed to ongoing reflection and professional development. We work collaboratively as a team to broaden our knowledge and strive for continuous improvement. We endeavour to draw out the individual strengths and skills of our team members. We believe in the importance of establishing relationships with the wider community and organisations. We strive to build strong networks that embrace diversity, advocate for children and provide support for families.